I first visited Paris when Christian Lacroix’s bubble skirts were all the rage and have returned a half dozen times since. But only on my most recent visit, in early April, did I venture into the realm of Parisian haute cuisine. If I’d somehow been intimidated until now – by both the ingredients and the prices (which can be so steep in the finest restaurants they are typically only listed on the menus given to the man) – I discovered that Paris’ top kitchens are definitely worth a splurge, especially when your raison d’etre for being there is romance. A Lofty Lunch With a View: For an unforgettable meal, book a table for lunch at least a week (two or three in peak season) in advance at Le Jules Verne (www.lejulesverne-paris.com). Located a bit less than halfway up the Eiffel Tower at about 410 feet (so just getting there in a private elevator is half the fun), this intimate, sci-fi-meets-one-Michelin-star enclave overseen by French culinary master Alain Ducasse and Chef Pascal Fèraud, offers an 85-euro (about $119) per person, three-course midday tasting menu that is one of the best values in Parisian fine dining. Each course has three options and my boyfriend and I – seated next to the window on a crystal-clear spring day with a mesmerizing view of the city (shown above at left) sprawled out beneath us – each sampled something different. Who made the better choices? It was impossible to decide. For appetizers, I chose French onion soup “in our way” and was delighted by its unexpected subtlety and textures, while he opted for the preserved duck foie gras, stewed fruit with bitter orange, which melted on the tongue. 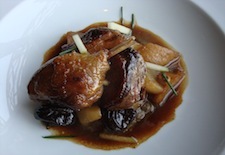 Next up for me was duckling cooked with turnips and plums in a cider reduction (shown at right), which had “autumn” (my favorite season) written all over it and was so flavorful I would have sopped up every last bit of “jus” with my bread had I been alone. My boyfriend ordered the fillet of plaice, tender potatoes with shellfish, lobster sauce and deemed it some of the best fish he’s ever had. For dessert, I couldn’t resist the chocolate/passion fruit crunchy, while my better half took his time savoring the flavors of his gingerbread/orange delicate bar, walnut, and honey tart. Neither of us will ever again look at the Eiffel Tower and not feel a pang of nostalgia – and undoubtedly a bit of hunger, too. 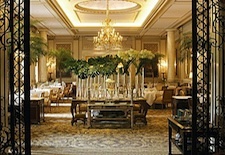 A Dreamy, Two-Michelin-Star Dinner: For fabulously romantic ambience, a formidable wine list (more than 40,000 bottles), flawless service, and, best of all, flavorful classic French cuisine using the freshest seasonal ingredients, Le Cinq, the grand and gilded signature restaurant (shown at left) in the Four Seasons Hotel George V Paris, is a must. It too offers an 85-euro, three-course prix-fixe lunch, but we visited during dinner, when the à la carte menu and accompanying wines easily push a meal into the $600-for-two realm (I snuck a peek at my boyfriend’s menu). That said, for a special occasion you should definitely indulge in the culinary craftsmanship of Chef Eric Briffard’s two-Michelin-star restaurant. After the enticing bread selection, which we savored with small dollops of delicious French butter, we each enjoyed a delicate amuse bouche trio of fresh seafood confections as we sipped glasses of Billecart Salmon Rosé. Both of our appetizers – fresh morel mushrooms and white asparagus for me and a symphony of salmon for him – were two-part affairs, which made the wonderful flavors last twice as long. We agreed on our entrée, sharing a tender lamb shoulder from the Aveyron region, prepared for two with delicate spices and fresh vegetables in a Moroccan-inspired tajine. The sommelier recommended we pair it with a 1999 Chateau Le Gay from Pomerol, and as we sipped this soft and earthy wine until every last drop was gone we entered a wonderful digestive trance. Next, our waiter arrived with two glasses of 1983 Banyuls “Select Vieux” Caves de l’Etoile, which, when paired with my chocolate and earl grey tea with pear hot biscuit with caramel and guanaja cream, pushed me into such a culinary ecstasy that all I remember about my boyfriend’s dessert was that he thought it was amazing. The sweet treats continued with a silver plate of melt-in-your-mouth macaroons and chocolates, as well as boxes of caramels to go, and a pair of personalized menus detailing our courses and wine pairings. I was in love – in more ways than one. A Modern Twist on Bistro Classics: Splurging on a gourmet lunch makes sense in Paris as the food is just as amazing and the prices are more reasonable. We opted to try the stylish Le 114 Faubourg, which opened in September 2009 at one of the Paris’s grand-dame five-stars, Hotel Le Bristol. 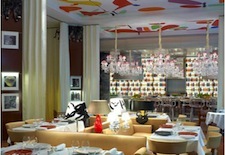 Sister to the hotel’s three-Michelin-star gastronomic restaurant, Le 114 Faubourg is a sleek, two-story eatery set beneath an atrium (shown at right) and brightened by panels of orange chrysanthemum paintings. Given its location on the fashionable rue Saint-Honore Faubourg, the restaurant, helmed by Chef Eric Desbordes (who was mentored by Le Bristol’s master, Chef Eric Frechon), attracts an upscale business and social crowd with time to indulge in a bottle of wine and two or three generously proportioned courses of modern interpretations of classic bistro fare – with an Asian-fusion twist here and there. Looking around, I noticed that my two choices – the signature “duck pie,” a mélange of duck breast, duck pate and duck liver baked into a mosaic-like slice, and the sole with fresh spinach in a capers and oil sauce – were quite popular. The duck pie was flawless (except for what it likely did to my cholesterol) and the sole was moist and flavorful, but the huge side of spinach was a bit too salty for my liking. My boyfriend gave two satisfied thumbs up to his thinly sliced fresh tuna with soy and ginger vinaigrette dressing and his monkfish with sweet chorizo, garden peas mousseline and paella juice. We finished by splitting the thin apple tart with Bourbon vanilla ice cream – which I find hard to believe one person could possibly devour! The generous portions and creative flavors make a three-course lunch at Le 114 Faubourg worth the tally of about $180 for two, not including wine (a special two-course prix-fixe brings the total down to about $120). A Savory Start and Sweet Finish at La Cuisine: You’ll definitely want to save room for dessert when you dine at La Cuisine, the haute dining room with a communal heart in the newly re-opened Le Royal Monceau—Raffles Paris. 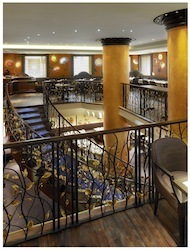 Not that the first two courses you choose from the contemporary French menu by Chef Laurent Andre aren’t worth savoring. They are – light, nuanced, contemporary interpretations of French specialties, a perfect match for the soaring, whimsical dining room designed by Philippe Starck that floats around you in a chandelier-lit halo of nostalgia-meets-now (shown at left). I started with Dublin Bay prawns from Scotland with avocado puree, lemon and olive oil, followed by delicate pan-fried sea scallops with Jerusalem artichoke and caramelized Belgian endive. My boyfriend began with medallions of Brittany lobster with a winter vegetable salad before slicing into a grilled fillet of black angus beef with romaine salad and boulangéres potatoes. I left room for a sweet finish and was tantalized when our waiter brought over a round sliding “wheel” menu with three slots. Turn this way or that and you end up with three ingredients in a custom-made mille-feuille, by the so-called “Picasso of pastry,” Pierre Hermé (www.pierreherme.com), of which there are 15 variations with three different puff pastries. My trio was chocolate, pistachio and caramel, each flavor layered in between perfectly buttery and flakey pastry layers. I can’t wait to try another combo the next time I get the urge to splurge. A three-course dinner for two runs about $350, not including wine. See our Paris Travel Guide for more trip-planning information, then use our Travel Search comparison tool for find the lowest rates on flights, hotels, packages and more travel deals.